This kit includes o-ring style footpegs, shift and brake pegs. The footpeg supports have female clevis. The brake pedal and shift lever ride on bronze bushings giving smoother pedal action. Comes with a ¾” bore chrome master cylinder. 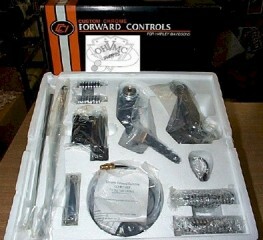 Installation instructions, a universal nylon brake line kit, mounting hardware and a selection of shifter rods provided. Fits all 4-speed FL, FX and FXWG models 1958 - 86 and 5-speed Softail® models from 1986 - 99. Will also fit 1936 - 58 rigid frames as well as custom frames that have been modified to accept hydraulic rear brakes. Some late model 4 speed FX's were manufactured without a mounting tab on the right end of the lower engine mount crossmember. These motorcycles will require the purchase of a weld-on frame tab sold below in the option menu.